Jews are "wicked," "oppressors," and "evil"
"Evil roles are always more difficult than the roles of good characters... The directors say about my eyes, that I act well with them, and that 'evil comes out of them,' as they say." Official PA TV program "Culture Talks", hosting actor Sami Sattoum, rebroadcast of a scene from the TV series "And You, Jerusalem" from 1996, in which Sami Sattoum plays a Jew. 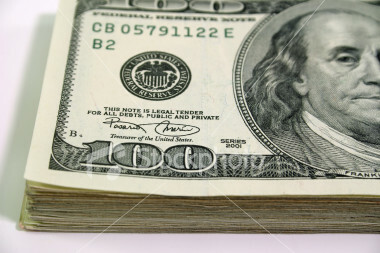 Jew: "They say the Arabs are generous. Maybe you would invite us in for a cup of coffee in your house?" 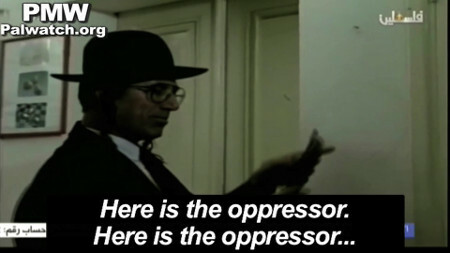 Jew, played by actor Sami Sattoum: "You have a nice house, Abu Awni, It's built in an old style." Arab: "This house was built by my grandfather's grandfather more than 200 years ago." Jew: "Does that make sense, Abu Awni? Your grandfather's grandfather built it over 200 years ago and it is still standing firm?" Arab: "Why doesn't that make sense? Even my grandfather's grandfather inherited the land from his fathers. I mean the land of the house." Jew: "Okay, can we look at the house, Abu Awni?" Jew: "We'll just look Abu Awni, we'll look at the house..."
and his eye is still on you, O house. 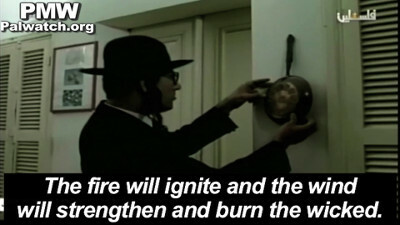 The fire will ignite and the wind will strengthen and burn the wicked. Here is the oppressor. 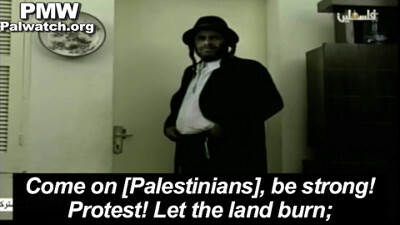 Here is the oppressor..."
Jew: "It is truly a beautiful house, Abu Awni!" 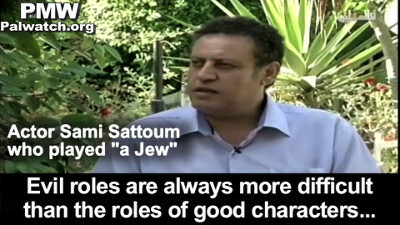 Actor Sami Sattoum, who played "a Jew": "Evil roles are always more difficult than the roles of good characters... The directors say about my eyes, that I act well with them, and that 'evil comes out of them,' as they say."